Leader in digital yard management and inventory solutions recognized as critical for companies in the global food and beverage supply chain. 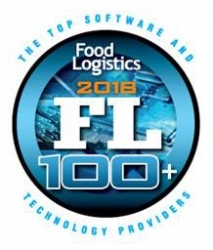 Union City, CA, January 10, 2019 --(PR.com)-- Food Logistics, the only publication exclusively dedicated to covering the movement of product through the global food supply chain, has named PINC to its 2018 FL100+ Top Software and Technology Providers list. PINC provides yard management solutions and inventory robotics technology to several food and beverage organizations across the globe, enabling these companies to identify, locate, and move inventory effectively and efficiently throughout the supply chain and enabling Food and Beverage teams to successfully become compliant to the Food Safety Modernization Act (FSMA). PINC provides scalable software, hardware, and services that enable companies to identify, locate, and orchestrate inventory throughout the supply chain predictably and cost-effectively. The company's cloud-based real-time tracking platform, powered by aerial inventory robots™ (drones) and an Internet of Things (IoT) sensor network that includes passive RFID, GPS, optical, cellular, and other sensors, provides actionable insights and connected expert guidance that allow companies to optimize their supply chain execution. Learn more about PINC at www.pinc.com.